Remember pin art? That’s the little box full of pins that you can push something into and the pins take on the shape. You usually use your hand, but any small object works (including, if you are brave enough, your face). [Sean Follmer] (formerly at the MIT Media Lab) developed the reverse of this: a surface made of pins driven by motors. Under computer control, the surface can take on shapes all by itself. The square pins can be seen in the video below moving and manipulating blocks and using them to build structures out of the blocks. By using the right sequence of pin motions, the blocks can be flipped and even stacked. Magnetic blocks offer even more options. For a rather obscure brand advertisement, Nissan decided to turn one of their cars into a giant Playstation 4 controller to play a game of football (soccer). The first question to pop into our heads was why? And that’s because Nissan is a major sponsor of UEFA Champions League. From there, it became why not? We love the companies that get their hands dirty on a hacking level, and actually do something instead of just funneling money into your standard billboard advertising — it’s just more fun this way. It’s kinda like tapping your head and rubbing your stomach at the same time, it really messes your head up — but it’s really enjoyable when you get it right. When [hobbyman] wanted some 3D printed parts to attach a bag to his bike, he was worried that the parts would not be strong enough to hold when the bag was full. He decided to find a way to reinforce the part with fiberglass and epoxy. His first model had holes and grooves to be filled in with epoxy. However, after working with the part for a bit, he decided to take a different approach. Instead of making the part nearly solid plastic with space for the epoxy, he instead created the part as a shell and then filled it with fibers and epoxy. After it all cured, a little sanding started removing some of the plastic shell and what was left was mostly a cast fiberglass part (although some of the plastic was left on). 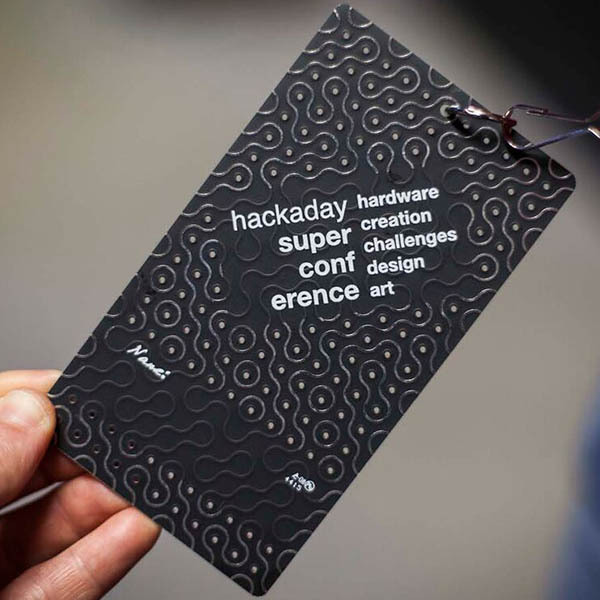 As with any proper hardware con, the Hackaday Supercon needed a badge, and preferably one that was electronic. This conference centered around hardware creation, and the badge was no exception. Designed on a tight timeline, it was possible to deliver a PCB badge for the attendees but it didn’t include microcontrollers, FPGAs, or software defined radios. This blank slate was the foundation for a completely unconstrained freestyle electronics soldering session. The front of the badge includes a matte black solder mask with Truchet tiles of traces. Put multiple badges edge-to-edge and the pattern continues indefinitely. Inside of each curved trace is a through-hole via and those makes up a grid of holes on the back of the badge. On that back side there are also two rectangular grids that presented a nice area to which hackers soldered their components. More than a few people took up the challenge of hacking their badge, and despite a strange pitch for the through holes (0.230″), and traces that didn’t go anywhere, there were some amazing builds. I would go so far to say that the badge hacking at the Supercon was the best I’ve ever seen, and this includes DEFCON and CCC. Everyone here at Hackaday is a big fan of Embedded.fm, the weekly podcast for people who love making gadgets, hosted by [Elecia White]. We’re honored that this week she has dedicating an entire episode to live interviews at the Hackaday SuperConference. The set of seven interviews are with some of the people who were working the SuperCon. These were recorded on the second day of the conference, after the Hackaday Prize had been awarded. It was also the morning after [Sprite_TM] presented an amazing talk which almost everyone interviewed mentions (don’t worry, video of that talk is coming soon). [Elecia] has a gift for interviewing and guides the conversation in many interesting directions: what the SuperCon is all about, background on the people who work on Hackaday, Supplyframe, and Parts.io, looks back at the 2015 Hackaday Prize, and what the future might bring. If you’ve ever wanted a candid behind-the-scenes look at the events and initiatives that go on around here, this is it. It’s told from the perspective of people who love devoting way too much time to Hackaday. We think [Elecia] is counted among them. Main Image: In true hacker fashion, [Elecia White] prepares to launch her LED throwie up to the second floor ductwork at the Hackaday SuperConference. Code Craft-Embedding C++: Hidden Activities? What is an embedded system? The general definition is a computer system dedicated to a specific purpose, i.e. not a general purpose system usable for different tasks. That is a very broad definition. I was just skimming the C++ coding guidelines for the Joint Strike Fighter. That’s a pretty big embedded system and the first DOD project that allowed C++! When you use an ATM to get money you’re using an embedded system. Those are basically hardened PCs. Then at the small end we have all the Internet of Things (IoT) gadgets. The previous articles about embedding C++ discussing classes, virtual functions, and macros garnered many comments. I find both the positive and critical comments rewarding. More importantly, the critical comments point me toward issues or questions that need to be addressed, which is what got me onto the topic for this article. So thank you, all. Let’s take a look at when embedded systems should or should not use C++, taking a hard look at the claim that there may be hidden activities ripe to upset your carefully planned code execution. When challenged with making a game for a kids event using only the parts he already had on hand, [Nathan Gray] had to get creative. What he ended up making is pretty awesome. It’s a Star Wars themed Nerf gun shooting gallery. Using a Teensy 2.0, he’s controlling nine RC servo motors attached to two-sided targets which randomize themselves every round — The Empire is bad, the Rebels, good. They’re also color coded red and green in case the images are too hard to see. To keep track of scoring, there are piezo elements which register the impact of a Nerf dart. A cute little command console with a big red start button and score display can be set up in front of the range to let the kids know how they’re doing.